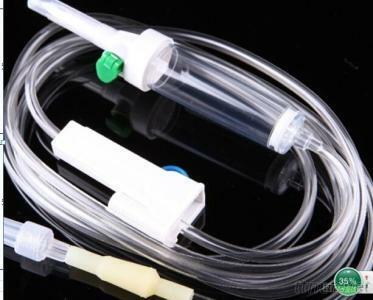 The pvc material has the advantage of good softness, elasticity and price but 35%-40% DEHP will be added in order to ensure the softness and elasticity when the pvc infusion set is manufactured. Some research shows that DEHP is a kind of Endocrine disrupters, which will interfere with the body hormone secretion, damage male reproductive ability and cause female precocious puberty. On the other hand, the pvc infusion set has adsorption to some medicines, which will affect the curative effect of the medicine. So it is very necessary to use DEHP free infusion set. The infusion set consists of spike, DEHP free drip chamber, 15μm liquid filter, 1.5m tube, luer lock connector, latex free hose. EO sterilizeration, blister package, 200pcs/carton.